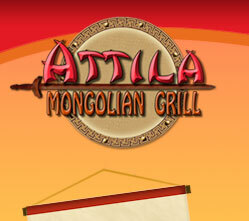 Attila Mongolian Grill offers world-class training to all of our area developers and franchisees. Before a store opens for business, we ask our new area developers/ franchisees to participate in our Franchisee Training Program, at one of our Training Centers. The program is a seven-days course presented by a qualified, trained instructor who covers essential topics for operating and maintaining an Attila Mongolian grill restaurant to corporate standards. Franchisees split their time between training in the classroom and in a live restaurant. Franchisees also work approximately 36 hours behind the counter in an operating Attila Mongolian Grill restaurant. Here they learn proper food preparation and organization, inventory tracking, product ordering/receiving from authorized suppliers, effective employee management, store maintenance and exceptional customer service techniques. As part of our support our training team will be on site for the first week during grand opening. Our staff with over 30 years of combined experience with the Mongolian Grill Concept and in the restaurant business will train your employees in all aspects of the operation of a Mongolian Grill Restaurant.